There are some combos that work great together. Feta and spinach are one of those combos! 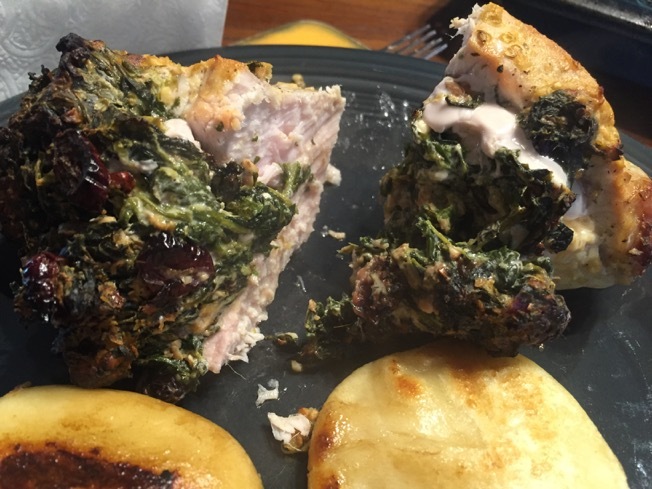 Succulent pork chops filled with creamy feta and spinach. There are more than a few ingredients here. 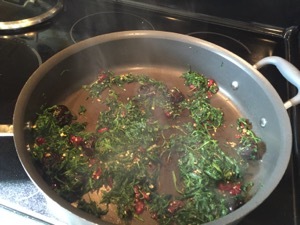 Cooking the spinach and Craisins. Take your thick-cut chops and cut a pocket into them. If you can keep the pockets pointing up it helps to keep the filling inside. Heat a large nonstick skillet over medium-high heat. Coat pan with cooking spray. Add 2 garlic cloves; sauté 1 minute. 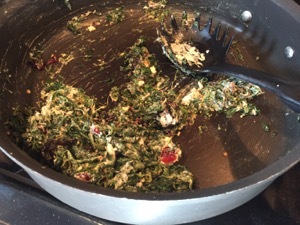 Add 1/4 teaspoon salt, 1/8 teaspoon pepper, tomatoes, and spinach; sauté until moisture evaporates. Remove from heat; stir in cheeses and rind. 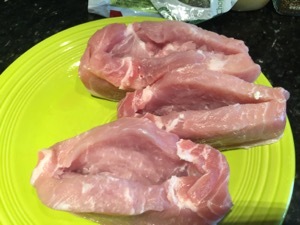 Cut a horizontal slit through thickest portion of each pork chop to form a pocket. Stuff about 1/4 cup spinach mixture into each pocket. Sprinkle remaining 1/4 teaspoon salt and remaining 1/8 teaspoon pepper over pork. 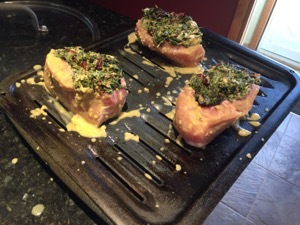 Arrange pork on the rack of a broiler pan or roasting pan coated with cooking spray; place rack in pan. Combine remaining 2 garlic cloves, juice, mustard, and oregano in a bowl; stir well. 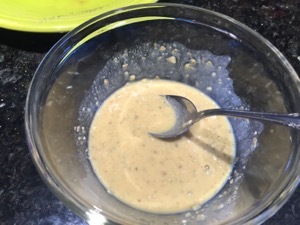 Brush half of mustard mixture over pork. Broil 6 minutes; turn pork. Brush remaining mixture over pork; broil 2 minutes or until done. Sounds delish. 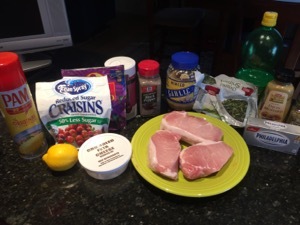 Some of my favorite food items (and ones even my husband will eat), so can’t wait to try. This is great!!! 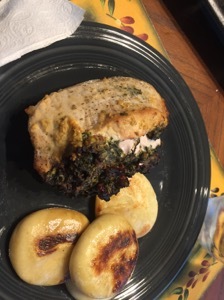 I usually do chicken breasts with spinach and feta…would love to try it with Pork chops sometime! !